Burke S, Lynch K, Moghul Z, Young C, Saviola K, Schenk R. The reliability of the cervical relocation test on people with and without a history of neck pain. J Man Manip Ther. 2016;24(4):210-214. Neck pain is a common disorder in the United States. This complaint affects millions of people per year with costs equaling billions of dollars in the United States alone.1 Neck pain can be present due to a chronic problem as well as acute dysfunction from whiplash. With neck pain, a dysfunction in the proprioceptive sense of the neck and errors in repositioning of the head on the neck can occur.2,3 According to Manchikanti et al, “54-60% of people present with chronic neck pain following a whiplash injury.”4 Changes in position sense of the head and neck is clearly evident in whiplash injury patients as well as other dysfunctions.5 While people seek treatment for the pain, the position sense may remain an untreated condition. 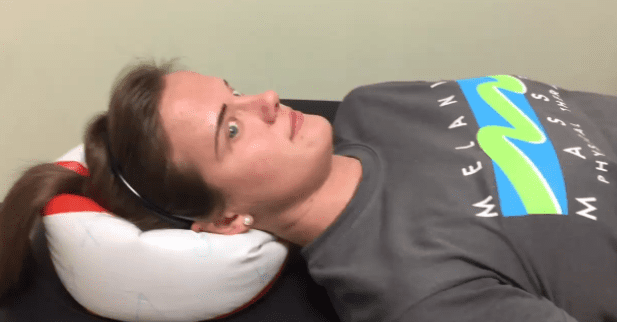 One test that is utilized to assess position sense in the cervical spine is the Cervical Relocation Test (CRT).3,6 Many studies have been performed to assess position sense with the ability to return the head to a neutral position; however, none have looked at the utilization of a CROM device with this test. Studies have shown the ability of utilizing the cervical relocation test with various instruments in assessing position sense. 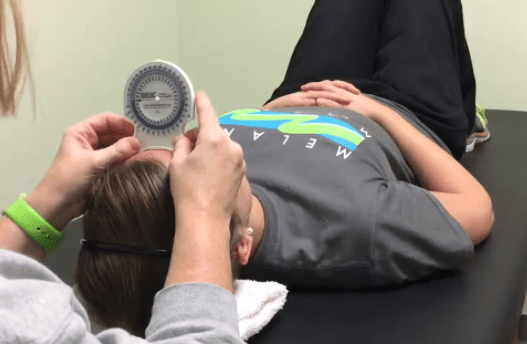 There are many studies that have shown the differences between the position sense of subjects with and without symptoms when utilizing the cervical relocation test (CRT). One study was performed with the use of a CROM in order to assess cervical position sense and found that relocation accuracy differed between symptomatic and asymptomatic subjects.7 Another study found that a relative head on trunk rotation, which activated cervical proprioceptors without activating the vestibular afferents, produced more position errors for those with symptoms versus the asymptomatic subjects with use of the laser and Fastrak measurement tools.8 Treatment for the neck for not only pain relief but for improving the proprioceptive system seems to be indicated due to the increase in joint position sense in those with neck pain. Much research has been done on the laser, Fastrak and US measurement tools; however, there is limited research on the reliability of the use of CROM with the cervical relocation test with either intertester or intratester reliability. This study was performed to determine the intertester and intratester reliability of utilization of the CROM device in comparison with a laser for measuring cervical relocation in those with and without neck pain. The CROM is an inexpensive and easily accessible tool in the clinic. This study included two groups of 25 subjects. The groups were split into two groups based on convenience. Each group was paired with each tester to perform the following tests utilizing the CROM and a laser. The 25 subjects in each group were analyzed independently of the other subjects. The exclusion criteria were: 1) being under the age of 18; 2) previous spinal surgery; 3) pregnant currently; 4) receiving care for neck pathology. The groups were split and tested with 2 testers where one tester utilized a laser and the other tester utilized the CROM. 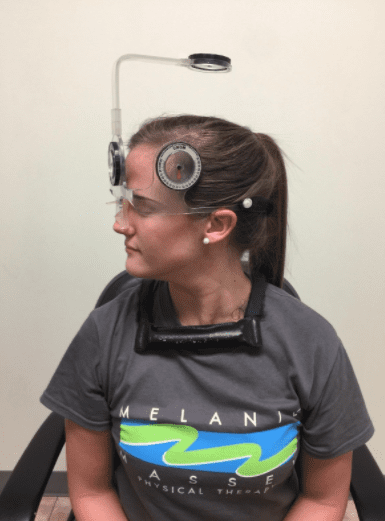 The subject was blindfolded (not in picture – subject is with her eyes closed) to inhibit visual input thereby forcing the subject to utilize their proprioception system in the cervical spine. The test began with the utilization of the CROM. The subject was asked to turn the head to the right (figure 1), pause at end-range (to allow documentation of the ROM) then return to their perceived neutral head position (NHP) and a recording of this rotation ROM was documented. Three trials were documented to the right then performed and documented to the left. The same test was repeated with a laser system. The subject was blindfolded (not in picture – subject is with her eyes closed) then the laser was placed on the subject’s head with the light at the forehead (figure 2). The subject was placed 3 feet from a wall with a target placed in front of the them. 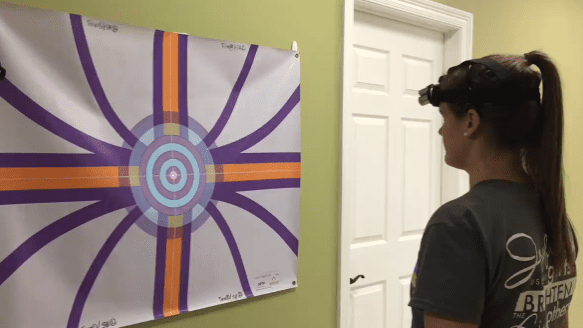 The return to perceived neutral position was recorded based on the laser projection on the target. This was done with 3 trials to the right and then 3 trials to the left with a brief pause at end-range and then returning to NHP. The reliability of the CRT to assess position sense has been established throughout the literature as previously discussed. This study determined that the interrater reliability using the CROM to measure CRT had ICC values > 0.75 showing a good reliability between testers with the same instrument. The intertester reliability with the laser was not as good as the CROM with an ICC value of 0.67. This could possibly be due to the challenging equipment fit of the laser as it was attached in the study with a one-sized bike helmet. A paired t-test showed no difference in the accuracy to relocate using the CROM in subjects with and without a history of neck pain. 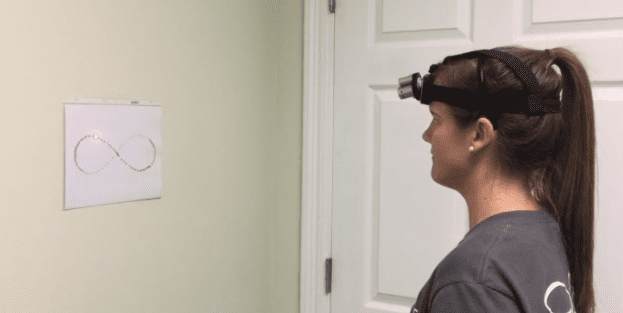 The CROM is a relatively inexpensive and accurate tool to utilize in the clinic to measure a patient’s proprioceptive sense in the cervical spine after trauma. Many patients present to the clinic with neck pain after various types of injuries whether traumatic or non-traumatic events. These patients will usually present with changes in their cervical position sense due to these painful events. 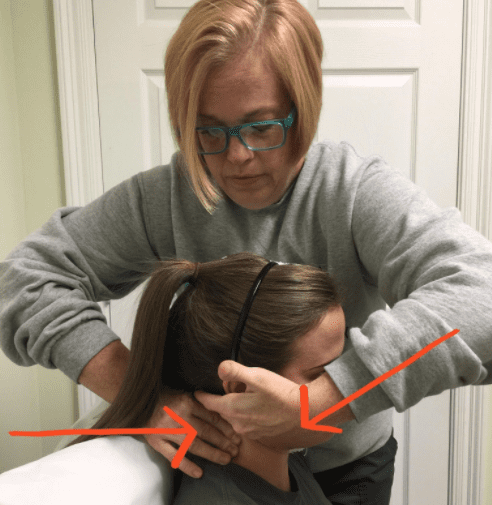 When there is a dysfunction of the position sense in the cervical spine, there will be dysfunction up and down the chain, which can lend to multiple dysfunctions ranging from stiffness, headaches, ROM deficits, muscular tightness and dizziness to name a few. There are many exercises that can improve position sense in the cervical spine. 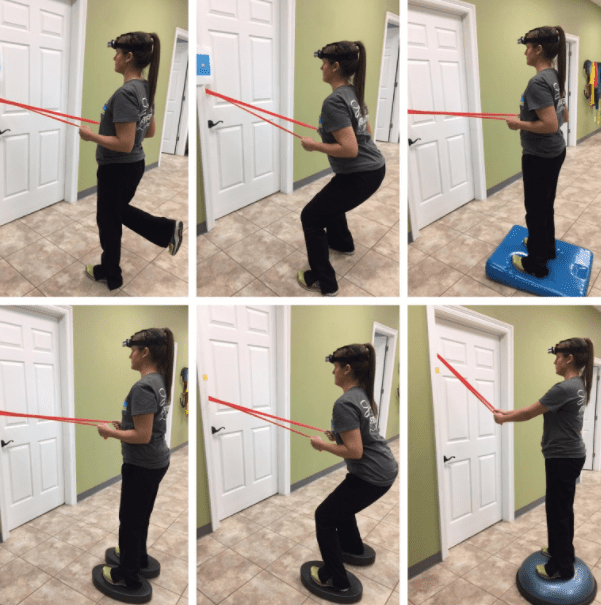 Peterson et al report that position sense can be improved through DNF activity, coordination exercises, including eye-head-neck exercises, as well as manual therapy techniques for improving segmental mobilization with the coordination exercises producing the largest effects on position sense.9 The following pages give various exercises as examples of what will improve these different areas previously mentioned. Figure : Deep Neck Flexion with Beach Ball Roll – Instructions are to perform DNF then rotate the head left and right. Figure : Deep Neck Flexion with Inclinometers – Pt head is rotated in 10˚, 20˚ and 30˚ degree increments in one direction and patient is asked to replicate this motion. The move is then increased to a full arc from left to right. Figure: Laser with Figure 8 motion — moving in a clockwise and counterclockwise direction. Figure: Laser with Clover with a clockwise and counterclockwise movement. 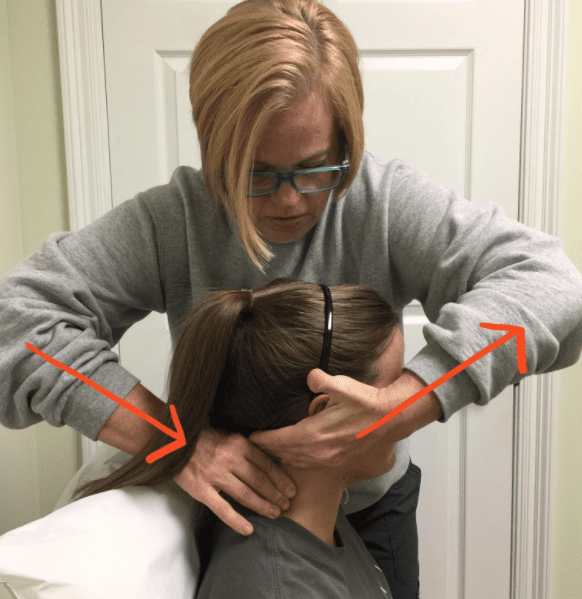 Figure: Segmental Extension Gliding — Lock the caudal segment by stabilizing it (pushing it in a ventral direction), then bring cranial segment into rotation and side-bending away from the treating clinician. Mobilization force through the cranial hand is in a caudal and dorsal direction with rotation away from the treating clinician. Figure: Segmental Flexion Gliding — Lock the caudal segment with a 90˚ angle from the line of the zygapophyseal joint (pushing in a ventral and caudal direction), then bring cranial segment into rotation and side-bending towards the treating clinician. Mobilization force through the cranial hand is in a cranial and ventral and rotation towards the treating clinician. Gaskin DJ, Richard P. The economic costs of pain in the United States. J Pain Off J Am Pain Soc. 2012;13(8):715-724. Armstrong BS, McNair PJ, Williams M. Head and neck position sense in whiplash patients and healthy individuals and the effect of the cranio-cervical flexion action. Clin Biomech. 2005;20(7):675-684. Pinsault N, Vuillerme N, Pavan P. Cervicocephalic Relocation Test to the Neutral Head Position: Assessment in Bilateral Labyrinthine-Defective and Chronic, Nontraumatic Neck Pain Patients. Arch Phys Med Rehabil. 2008;89(12):2375-2378. Manchikanti L, Singh V, Rivera J, Pampati V. Prevalence of cervical facet joint pain in chronic neck pain. Pain Physician. 2002;5(3):243–249. Sizer PS, Poorbaugh K, Phelps V. Whiplash associated disorders: pathomechanics, diagnosis, and management. Pain Pract. 2004;4(3):249–266. Pinsault N, Vuillerme N. Degradation of cervical joint position sense following muscular fatigue in humans. Spine. 2010;35(3):294–297. Wibault J, Vaillant J, Vuillerme N, Dedering Å, Peolsson A. 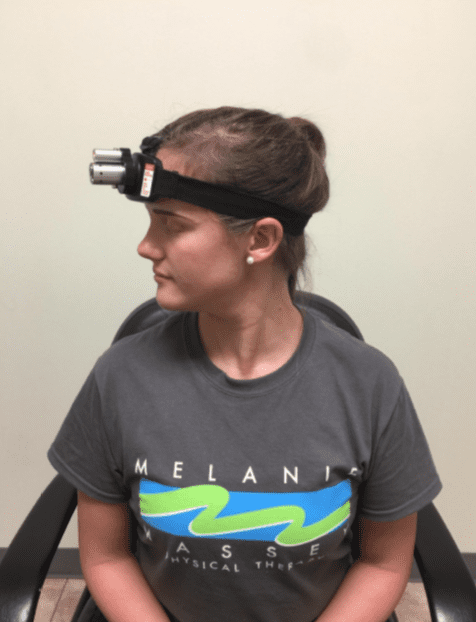 Using the cervical range of motion (CROM) device to assess head repositioning accuracy in individuals with cervical radiculopathy in comparison to neck- healthy individuals. Man Ther. 2013;18(5):403-409. Chen X, Treleaven J. The effect of neck torsion on joint position error in subjects with chronic neck pain. Man Ther. 2013;18(6):562-567. Petersen CM, Zimmermann CL, Tang R. Proprioception interventions to improve cervical position sense in cervical pathology. Int J Ther Rehabil. 2013;20(3):154-163.